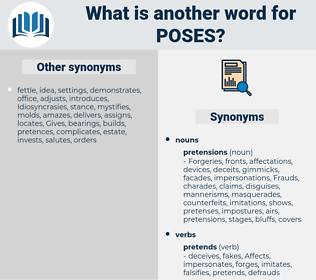 What is another word for poses? provoke, Stokes, brings, trigger, triggers, spur, spurs, prompt, prompts, spark, sparks, ignite, stir, fuels, Leaves, draws, fans. exposes, opposes, proposes, possesses, impose, imposes, supposes, jeopardises, comprises, espouses, constitutes, jeopardizes, threats, threatens, endangers, Presenting, presents, compromises, correspond, corresponds, representative, existing, exists, symbolises, emphasises, serious, complicates, arouses, portrays, discloses, promises, encompasses, arise, arises, showcase, criticises, participates, suggests, positions, recognises, symbolizes, opens, demonstrates, incorporates, risk, Risks, showcases, explores, posits, impedes, appears, hazards, suffers, undermines, necessitates, obstructs, REPS, accompanies, reports, concerns, characterizes, Guarantees, develops, confronts, strengthens, Exercises, foresees, encapsulates, depicts, summarises, occupies, deploys, questions, employs, hampers, generates, impairs, performs, Addresses, originates, stimulates, illustrates, sends, points, contributes, enqueues, epitomizes, eliminates, Affects, encourages, expresses, surrenders, belongs, closes, spells, underscores, forwards, specifies, emphasizes, reproduces, entail, Entailed, entails, inspires, involves, compels, spends, implements, embodies, dominates, erodes, speaks, considers, operates, stipulates, attests, becomes, serves, seems, outline, outlines, shapes, stresses, influences, presumes, identifies, inflicts, contends, compiles, signifies, submits, profiles, reproaches, mentions, Violates, consists, rises, releases, assembles, explains, attributes, contains, engenders, consumes, hinders, summarizes, promotes, recommends, enshrines, depends, provide, provides, calculates, declares, distinguishes, ensuing, evokes, prevails, obligates, subtracts, confers, supplies, prefers, incurs, collects, communicates, enjoys, exhibit, Exhibiting, exhibits, establishes, gathers, shows, indicates, is, articulates, publishes, conceals, boasts, creates, prevents, shares, fosters, organizes, solidifies, initiates, delivers, implies, conveys, reiterates, prejudges, reflects, envisages, seeks, prepares, advocates, invites, spawns, sees, highlights, prohibits, emanates, remains, translates, examines, obliges, ensures, determines, denotes, Faces, weighs, incites, reveals, elicits, constructs, occurs, assumes, appoints, wears, appreciates, informs, combines, enforces, rep, saves, inhibits, results, recognizes, lies, undertakes, follows, captures, objects, sells, enjoins, discusses, manages, equates, lodges, continues, commits, engages, delegate, receives, prescribes, formulated, formulates, monitors, describes, tackles, unleashes, harbours, furnishes, installs, arranges, proves, interferes, displays, expects, behaves, dictates, prints, throws, emits, Comes, produces, ready, readies, converts, includes, instills, stands, attracts, qualifies, upholds, grave, stems, files, signals, commands, maintains, deletes, infers, excites, elevates, lays, enables, affords, yields, fulfills, underlines, sets, Strikes, hosts, relieves, stays, instils, Bears, stirs, equals, respects, covers, reduces, features, leads, achieves, reviews, begets, deducts, keeps, floats, conducts, relies, approaches, Carries, breeds, demands, paints, renders, braces, refers, arrives, exacts, believes, argues, joins, awakens, target, punishes, extends, enters, looks, returns, rejects, place, places, teaches, regards, writes, announces, feels, concludes, happens, drafts, tells, introduces, tends, PAVES, relates, starts, leans, owns, reaches, unveils, remits, ask, asks, sounds, alludes, Levies, holds, accounts, lists, attaches, like, likes, Gives, says, induced, induces, Focuses, 's, eggs, coach, switches, defines, hovers, aligns, allows, requires, Drives, applies, launches, totals, states, begins, pays, amounts, meta, adds, plans, turns, ranks, Plays, varies, deals, wishes, pits, begs, meets, puts, means, goes, Cries, Has, runs, goal, Grants, calls, trains, matches, fires, lifts, claims, pulls, urges, marks, builds, takes, finds, falls, tries, acts, thinks, Does, sheds, ai, gets, makes, wants, provokes, provoke, triggers, spurs, prompts, sparks, draws, represents. provokes, raise, raises, casts, represents. 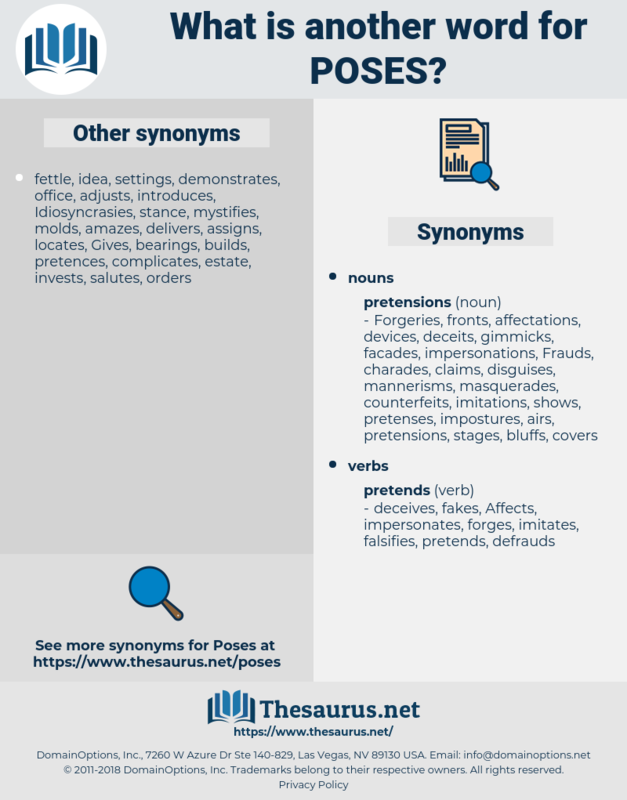 presupposes, predisposes, nominates, offers, encounter, encounters, raises, brings, casts, Leaves. He poses as a great moralist, but he teaches the morality of direct utility. I thought with sudden dismay that this was the end of it; that after one more day I would be no longer able to come into this verandah, sit on this chair, and taste perversely the flavour of contempt in her indolent poses, drink in the provocation of her scornful looks, and listen to the curt, insolent remarks uttered in that harsh and seductive voice.